Tear the romaine leaves into bite size pieces. I usually rinse them first, then tear, then spin them dry in my salad spinner. If you like to dry them by rolling them up in a towel, I suggest drying them first and then tearing. You can also chop them up with a knife if you prefer. Place in a large salad bowl. 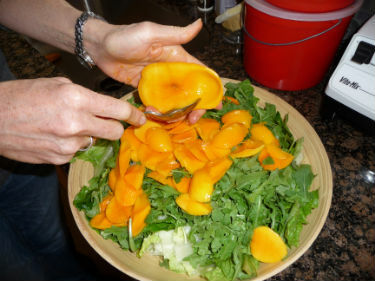 Add bite-size pieces of mango to the salad bowl. Hugh introduced me to his spoon method for getting the mango flesh out of its skin, and I'm so into it now. You stand the mango on end, stem end down and pointy end up. Then you slice down vertically on one side, getting as close to the pit as you can. Turn and do the same thing on the other side. At this point you have two inviting open halves where the mango flesh is just waiting to be spooned out of its shell and into the bowl. Hold one in the palm of your left hand and spoon out bite size scoops with the spoon held in your right hand (reverse if you're left-handed.) I leave the inner portion with the pit for the end. The number of mangoes to use is flexible, depending on how large they are, how large your head of romaine is, how hungry you are, and whether you prefer a sweeter or more savory salad. You can also use any variety of mango for this salad, probably using fewer mangoes if you have a really large type to use. The ataulfos are the small yellow ones. They have a sweet, creamy buttery flesh that has almost no strings in it, and they're by far my favorite of all the varieties I have ever tried. Sometimes they're called champagne or manilla mangoes too. Add two handfuls of arugula. I prefer the small wild arugula leaves so I don't have to chop them, but any size will do. Like the mangoes, the amount of arugula is flexible, depending on how peppery your arugula is and how must zip you want the salad to have. The last thing I do is slice the band of shell away from the center portion of the remaining mango centers, and with a knife, cut a last few chunks into the salad. Then I eat the rest off the pit - don't want to waste any of that luscious mango! Toss the salad well with your hands or tongs, coating all the greens with the mango pieces and juice. This makes a yummy dressing and no oil or avocado is needed. Then grab a fork and settle in for an absolutely delicious salad! It's so good that I'm eating this almost every night right now. What a great combination. I wouldn't have thought of it, but it really works well - the sweetness of the mango balances the bitterness of the arugula. I also love the method for spooning mango flesh out of its skin. Thanks!